Beta-release, please report bugs and tell me what to improve. I’ve been meaning to do something exactly like this! Thank you so much, this is great! I’ll report back if I run into any issues. Hmm, not working for me. This is ace, thank you! I’m having the same issue here - every time I switch to a new tab I have to ctrl-f5 to get it to show. On the standard HA interface when you click on the media player it gives you a text-to-speech box - could this do that too? Disabling cache works for one tab, but I have these on multiple tabs and it does not work. Which ever tab I hit ctrl + f5 on will stick. I’ve tried clearing the cache before I posted. Haven’t had a chance to look at disabling the cache, but it looks like the opposite problem almost, as in its not caching it when it should be so you have to reload the page to get it. Let’s say I have 3 tabs and one of these on each. I restart HA and none of them are there. I’m on tab 1 and I refresh, the one on tab 1 appears, go to tab 2 or 3 and they’re still missing, but if I go back to tab 1 it’s still there. So I go to tab 2 and refresh, tab 2’s one appears, but tab 1’s is now gone. In fact, just to add, they’re not appearing on my phone at all, just the desktop. OK, done on phone (definitely as I had to log back in), no change, still not appearing, just an empty card. @eddi89 - any further ideas on this issue a couple of us are having? Tiles work perfectly, media centres have to be refreshed each time you need them to show on a different tab from the one you last refreshed. 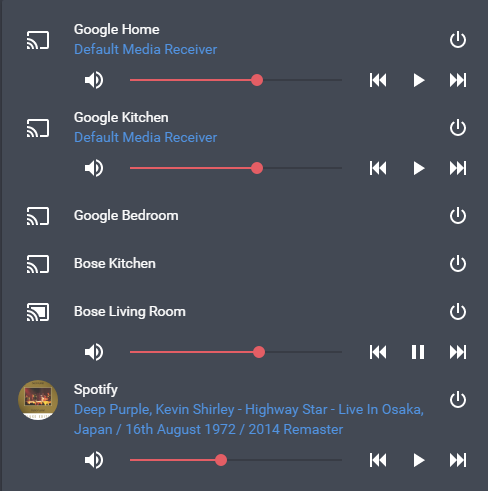 I have done all my speakers 2 of BOSE Soundtouch 10, Google Home and 2 Google Mini. and of course the spotify media player. 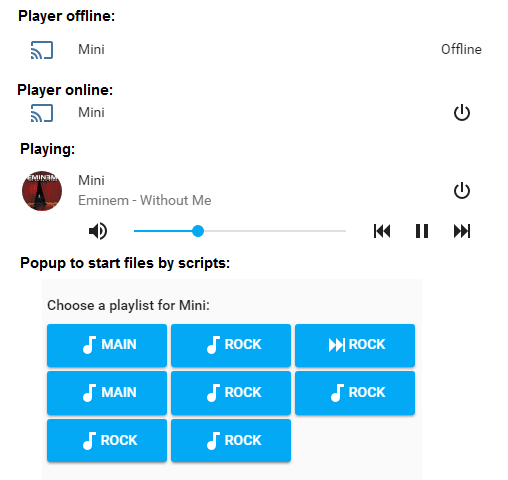 I was wondering if you can put into the popup that has the playlist buttons on the Spotify player the source select. And not sure why this works with the BOSE speakers but not the Google home. Safari requires me to manually refresh the page to see the players (even then the players appear only sometimes). On the iPhone, the players never appear.